Source: Schultze, Werner (1953): Farbenphotographie und Farbenfilm. Wissenschaftliche Grundlagen und technische Gestaltung. Berlin/Göttingen /Heidelberg: Springer. Source: Society of Motion Picture and Television Engineers; ed. 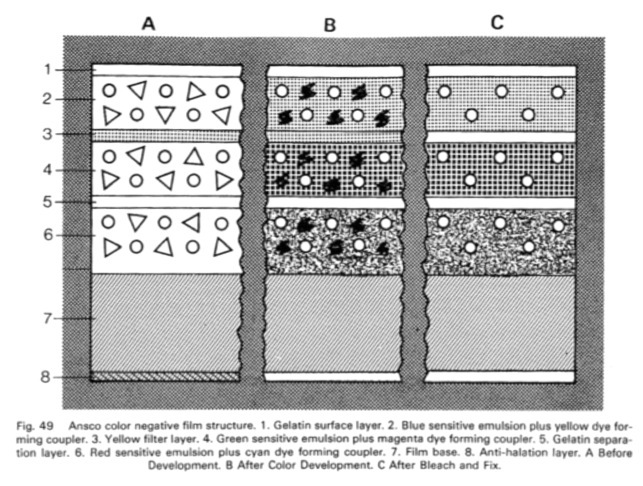 (1957): The Elements of Color in Professional Motion Pictures. Prepared by a special committee of the Society. Wilton R. Holm, chairman. New York: The Society. Sins of Jezebel (USA 1954, Reginald Le Borg). Credit: Courtesy of The Museum of Modern Art Department of Film. Sins of Jezebel (USA 1954, Reginald Le Borg). Credit: Courtesy of The Museum of Modern Art Department of Film. Photograph by Barbara Flueckiger. 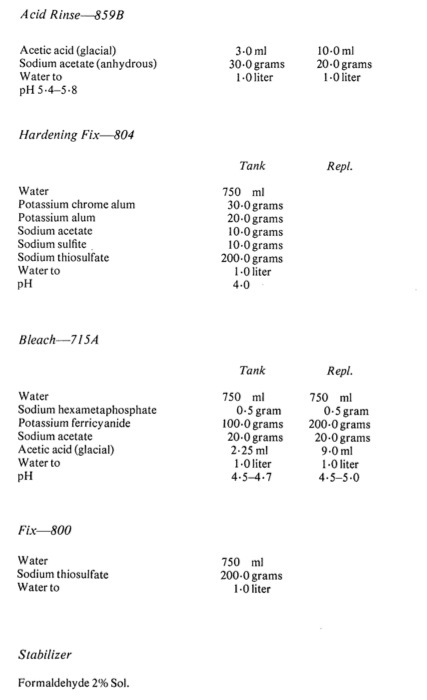 Duerr, Herman H. (1952): The Ansco Color Negative-Positive Process. In: Journal SMPTE, Vol. 58, June 1952, pp. 465-479. 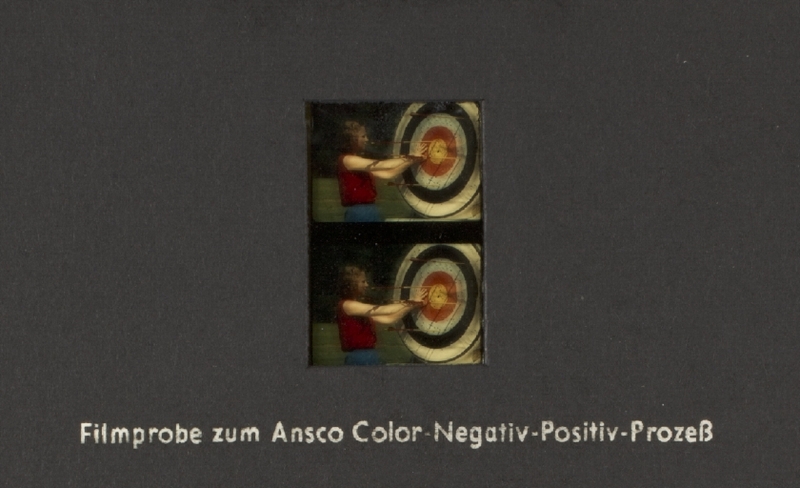 Schadlich, Karl (1956): Professional Printing Techniques for Ansco Color Negative-Positive Motion Picture Film. In: Journal SMPTE, Vol. 65, July 1956, pp. 375-377. 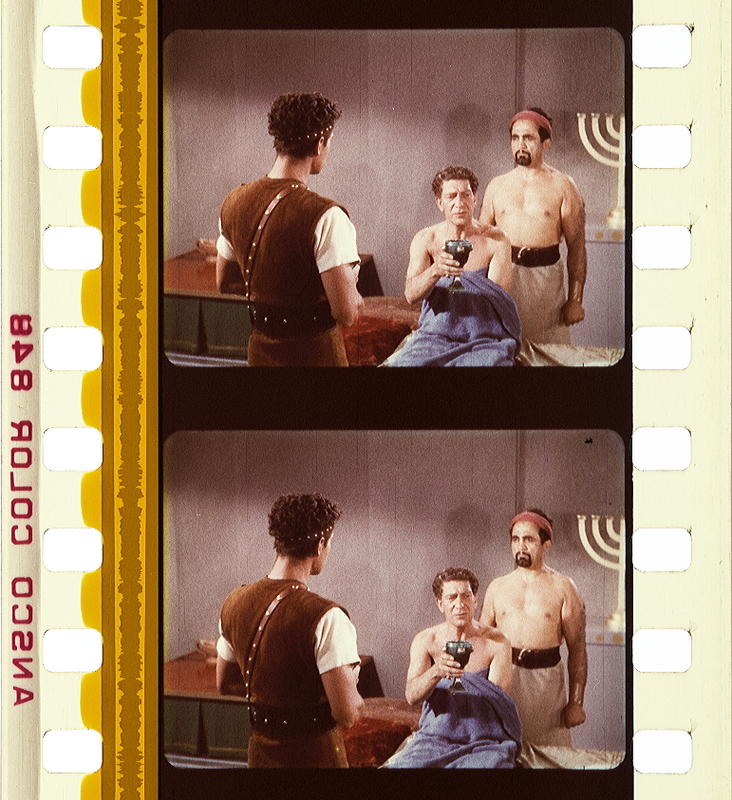 Some well-known titles, like Kiss Me Kate (3D and 2D), Arena (3D) and The Long, Long Trailer are sometimes credited to the Ansco Color Negative/Positive process. However, filmed on Ansco Color Negative, the release printing was done by Technicolor’s imbibition process (see statement of the former Technical Director of Ansco in Duerr ). 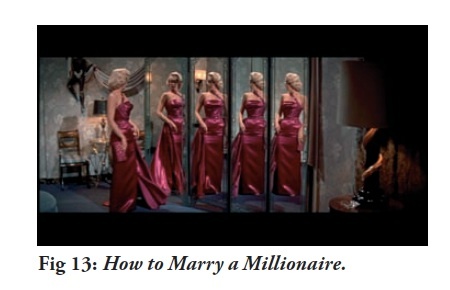 2 Mamoulian, Rouben (1960): Color and Light in Films. The Esthetics of Colour. In: Film Culture, 21, pp. 68–79. 3 Spehr, Paul C. (1979): Fading, Fading, Faded. The Colour Film in Crisis. In: American Film, Nov., pp. 56–61. 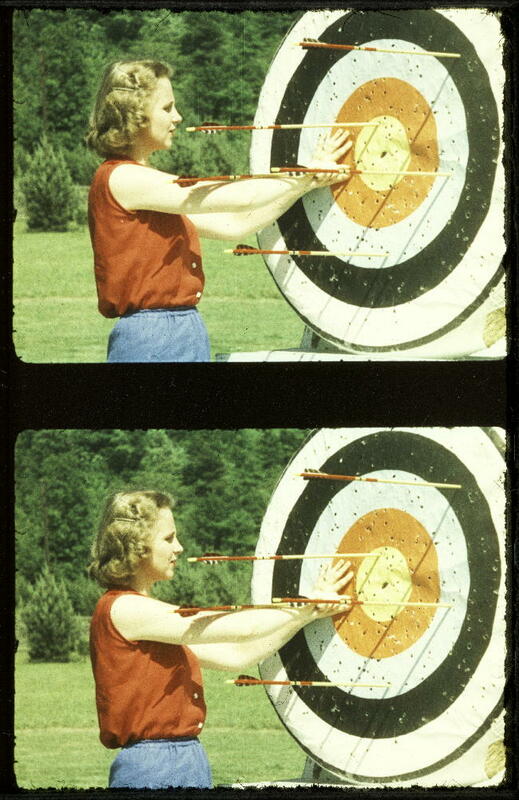 Schadlich, Karl (1956): Professional Printing Techniques for Ansco Color Negative-Positive Motion Picture Film. In: Journal of the SMPTE, 65, July 1956, pp. 375–377. Single color-negative requires no special camera, is developed and printed by the studio. Prints are marked by unusual clarity, richness and definition. The Wild North, first full length feature production made with the new Ansco Color professional film, is Metro-Goldwyn-Mayer’s answer to a long search for and the development of its own color filming process. Scheduled for general U. S. release late this month, The Wild North recently was previewed in Hollywood. Its first foreign presentation took place in London, late in January. 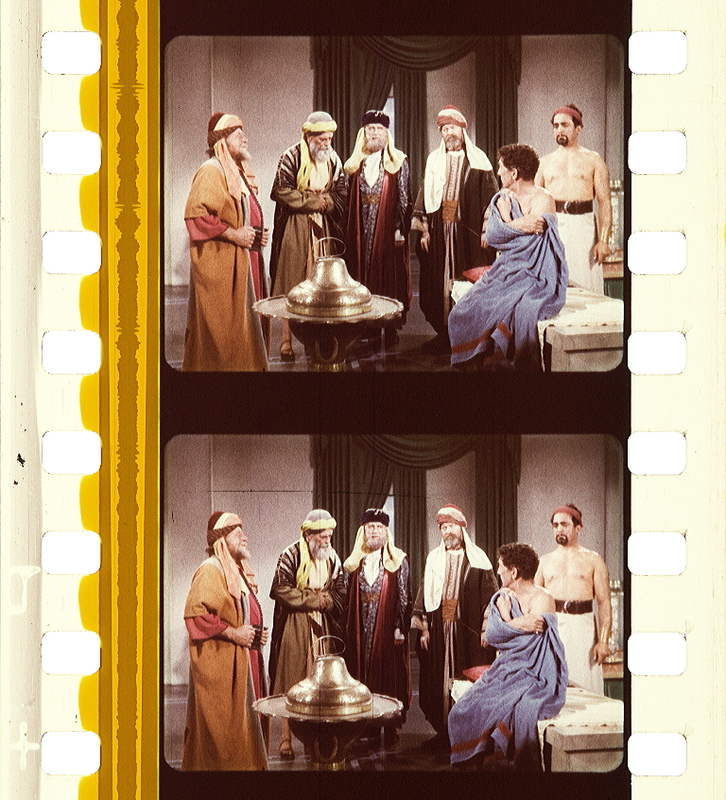 The accolades resulting from these initial showings are attracting wide interest in the longheralded Ansco Color professional film, and compliments for MGM’s technicians who achieved such remarkable results with it. The new Ansco Color process consists of a combination of camera, duplicating and printing films of the multilayer, complementary color type. Each film has a “pack” of three color-sensitized emulsion layers and a filter layer coated on safety film base, the individual layers being so thin that the total thickness of the pack exceeds only slightly that of most black-and-white negative emulsions. Type 843 Ansco Color negative camera film. Type 846 Ansco Color negative duplicating film. Type 848 Ansco Color positive printing film. Ansco Color Compensating travelling matte film. 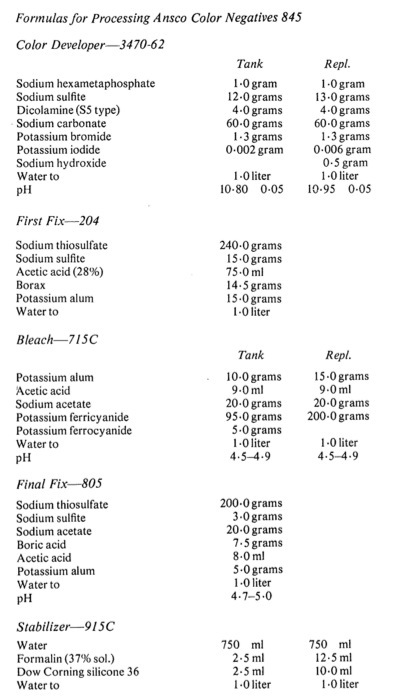 The laboratory processing sequence of these color films is similar to that of black-and-white motion picture films, with only a bleach solution added between the developer and the fixer. No complicated processing equipment is required. There is an interesting two-phase story in the production by MGM of its initial Ansco Color feature film: first the studio’s development and adaptation of the Ansco Color process for its feature-length productions, and second the actual photography of The Wild North. As have other Hollywood major studios, MGM long had the desire to develop its own color filming process, which would enable it to achieve greater studio control plus increased speed in the making of color pictures. 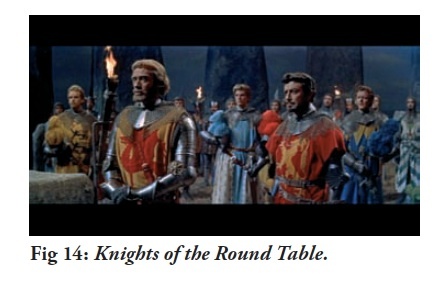 Simultaneously, with MGM’s initial developments, 20th Century-Fox and Warner Brothers set out to explore other color film processes for similar reasons. 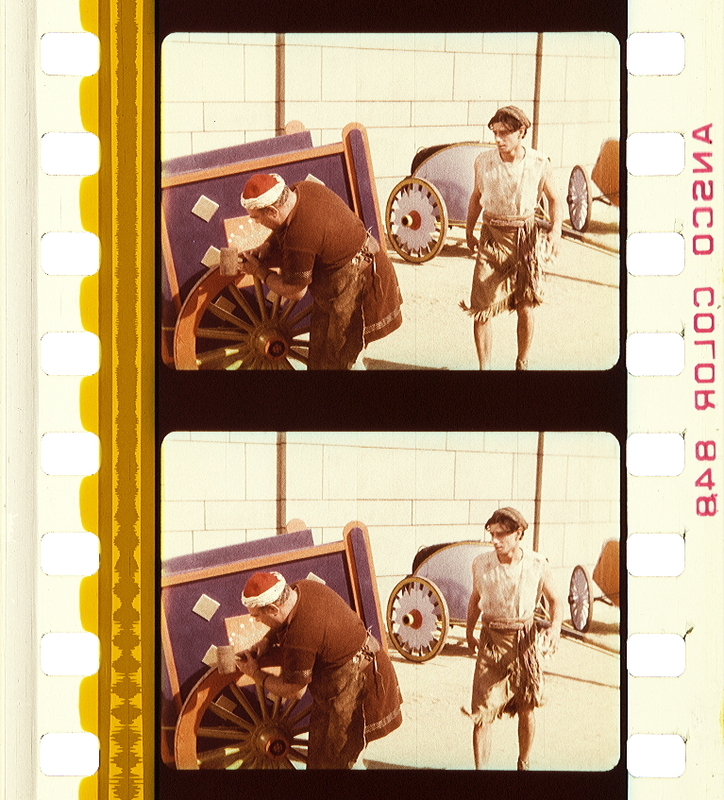 Metro’s initial exploration of Ansco Color began several years ago when John Arnold, the studio’s executive director of photography, chanced to see one of the first feature productions in Ansco Color made in this country. The picture, Sixteen Fathoms Deep, was photographed on the old Ansco reversible 35mm color film. Although, photographically, the production left a lot to be desired, still, Arnold saw possibilities in it as the medium for MGM’s color process. He was especially attracted by the fact the studio could process the film in its own laboratory and make the release prints, enabling it to maintain complete control over color productions from beginning to end. Arnold arranged a screening of Sixteen Fathoms Deep for MGM production heads; their reaction encouraged him to continue further study of the film. A supply of Ansco color film was obtained and there ensued many months of experimenting, with the object of determining the most desirable lighting and photographic procedure for the medium. Having extensively studied all the color films that have been developed to date, Arnold holds that satisfactory screen results can be had with most of them providing that the matters of correct color temperature for set illumination and the proper filters for photography are properly dealt with, and the correct procedures for each are established for those who are to work with such films. Some color processes possess certain attributes that are not found in others, such as simplicity of use in the camera and in the laboratory, which are important to the final screen result. In the early days of MGM’s exploration of Ansco Color, the studio had no developing equipment for the film. The laboratory work, therefore, was done by a local commercial film lab specializing in Ansco color processing. Later, John Nicholaus, MGM’s film laboratory head, converted some of the studio’s developing equipment for processing Ansco Color. Other equipment was built for making duplicate prints. All during this initial stage of exploration, Ansco factory technical men worked in close cooperation with Arnold and Nicholaus; and when, later, Ansco brought out its newer Ansco Color negative-positive process, MGM studio was made the principal testing ground for the new product. All this generated renewed enthusiasm in the studio for the development of MGM’s own color filming process. Ensuing months saw the Ansco film put through every conceivable test. One of the most conclusive resulted from photographing Ansco Color right along side the production cameras on several important sets of MGM color films then in course of shooting. The object of these tests, of course, was to determine how Ansco Color negative would respond to the set lighting and makeup currently in use for color at the studio. Similar research continued for several months, culminating in what proved to be, perhaps, the most decisive test of all. This was the test made in the Hawaiian Islands during the time the studio was making one of its big color productions there. 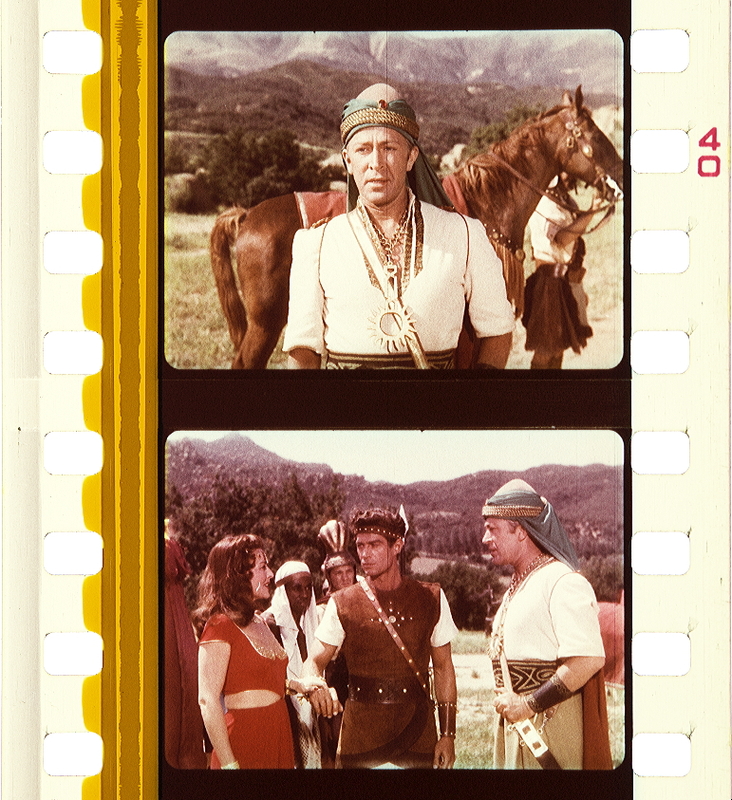 Ray Rennahan, A.S.C., shot a thousand feet of the Ansco Color negative on the rich Hawaiian exteriors which Charles Rosher, A.S.C., simultaneously was shooting for MCM’s Pagan Love Song. After evaluating the results of all tests made to date, it was decided that the studio had gone about as far as it could in its explorations with Ansco Color. The next step was to put the film to use in an actual production. The Wild North, then titled The North Country, was the first production on MGM’s color film schedule to be considered. Here was a story that had everything necessary for an exhaustive test of any color film: dark, rugged interiors of a north woods cabin; rich exteriors in majestic mountains, both in summer and winter; and snow – always a challenging condition for the color cinematographer. Because a great deal of the story was to be shot in snow, Arnold decided to find out first how Ansco Color negative would respond to snow photography, and especially to the extraneous light snow reflects. 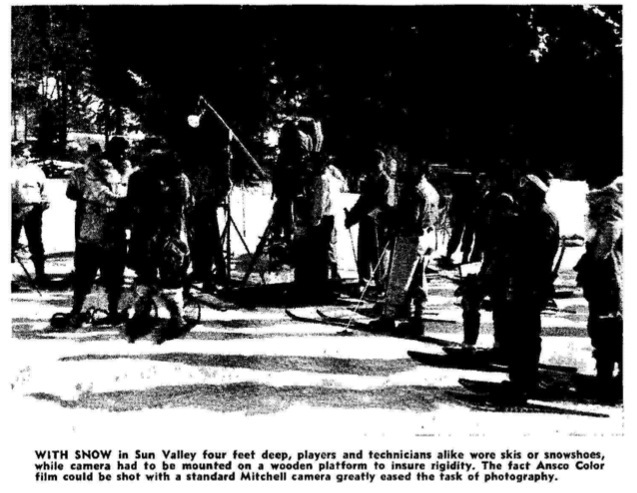 Taking a camera and crew into the mountains north of Los Angeles, he photographed snow scenes at all hours of the day; in bright sunlight and in shade; at high noon and at dusk; at the same time testing the various filters which he had previously developed especially for Ansco Color during earlier studio experiments. MGM executives were so elated over the results, they sent the film to the studio’s New York office for its reaction. 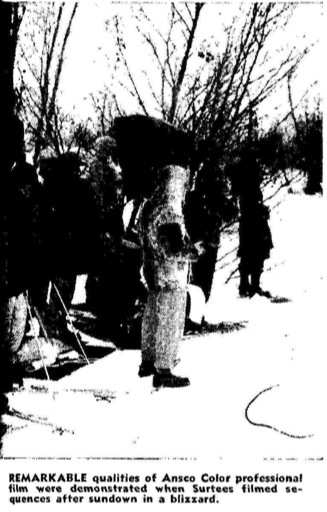 While awaiting approval, Arnold turned his attention to solving a serious problem that arose while filming the snow scenes in the mountains. This was the matter of sluggish camera movement caused by congealed lubricant, resulting from low temperatures in cold weather. A small electric heating unit operated by an ordinary 6-volt storage battery, was attached directly to the vital center of the camera mechanism. Following local tests, the unit was found to work perfectly and cameras thus “winterized” were shipped to Idaho, where the second phase of this story – the actual photography of The Wild North – begins. 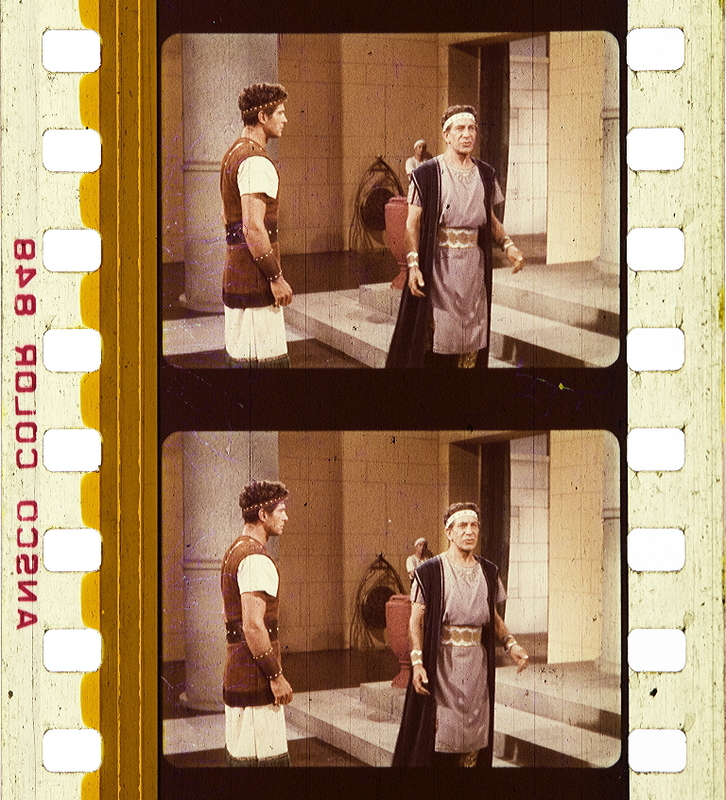 METRO-GOLDWYN-MAYER chose one of its most illustrious directors of photography to photograph its first Ansco Color feature-length production – Robert Surtees, A.S.C., who won an Academy Award last year for his Technicolor photography of King Solomon’s Mines, and who subsequently was assigned to photograph Quo Vadis in Rome. In The Wild North, he had another picture calling for shooting off the lot, away from the usual studio conveniences – a story calling for both summer and winter locales in rugged mountains; long sequences to be shot in snow – real snow, not studio prop stuff. Thus the frozen north became the exciting panorama against which a man hunted for murder saves the life of and nurses back to health the Mountie sent into the desolate wilderness to bring him to justice. When Surtees first started shooting in the dazzling brilliance of the snow country, the first thing he noted was the extreme readings given by his light meter – the result of light reflected from the snow. Thereafter, he followed the old reliable practice of taking a meter reading from the palm of his hand – holding the meter about 8 inches away. The result: perfect skin rendition every time. There are two dramatic and photographic highlights in the picture – the first, the attack of Stewart Granger and Mountie Wendell Corey by a pack of wolves. 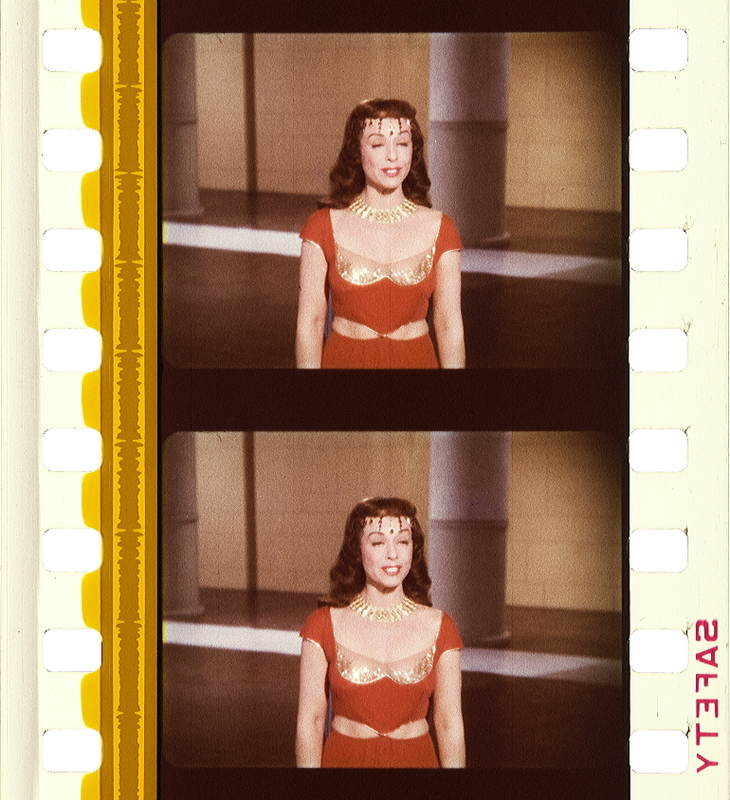 This exciting sequence was photographed by Surtees on an MGM sound stage with telling results. Here skillful lighting and camera manipulation, thanks to the remarkable characteristic of Ansco Color to render detail in low-key illumination, make this a breathtaking event to watch on the screen. The second dramatic highlight is the trip through the rapids in a canoe, when Granger exposes Corey to the same ride on the rapids he himself experienced when the man for whose murder he is being sought was shot. True to Granger’s conviction, Corey, faced with a threat to his life, aims a shot at Granger. This remarkable action footage was photographed by another MGM cinematographer, Harold Lipstein, A.S.C. Some of it was achieved by process photography, but for this, Lipstein also furnished the background plates. 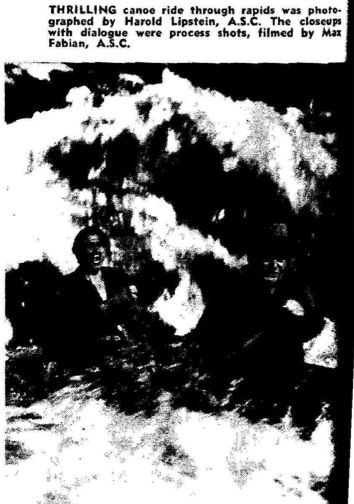 The script called for recording the two desperate men in the canoe in closeup in order to capture the emotion in their faces contrasted with the turbulent rapids boiling all around them as they fought to keep the craft afloat. To photograph this with all the punch and reality demanded of the script, Lipstein had dolly tracks built out over the river, from the bank, so the camera could be pulled back as the canoe approached. For still other closeup shots, Lipstein had two canoes lashed together and a platform placed across the two on which the camera was mounted. This formed a camera-dolly-on-water, which enabled the camera crew to ride the rapids just ahead of Granger and Corey – with the camera focused upon them for some of the most realistic footage in the picture. The major advantages of the Ansco Color negative-positive process, according to Surtees, are that processing can be accomplished in the studio’s own film laboratory, and that the new material makes filming a relatively lower cost operation, because standard black-and-white equipment may be used for filming and processing. Among the cameraman’s advantages is the film’s higher speed which makes it possible to “stop down” and thus gain depth of field and sharper definition in both foreground and background. Skin textures and color rendition in general seem a little softer – a bit on the pastel side – and more like that seen by the eye. Colors never obtrude on the scene; there are never any exaggerated blue skies or blatant reds. Ansco Color film possesses photographic latitude ranging from realistic highlights to the detail inside deep shadows. A new consciousness of the unlimited possibilities of color is making itself felt in the motion-picture industry. Not only are more feature pictures filmed in color than ever before, but newer full-color processes which permit greater photographic freedom, studio color-film processing, and release-print manufacture by regular “black-and-white” laboratories, are very much in evidence. 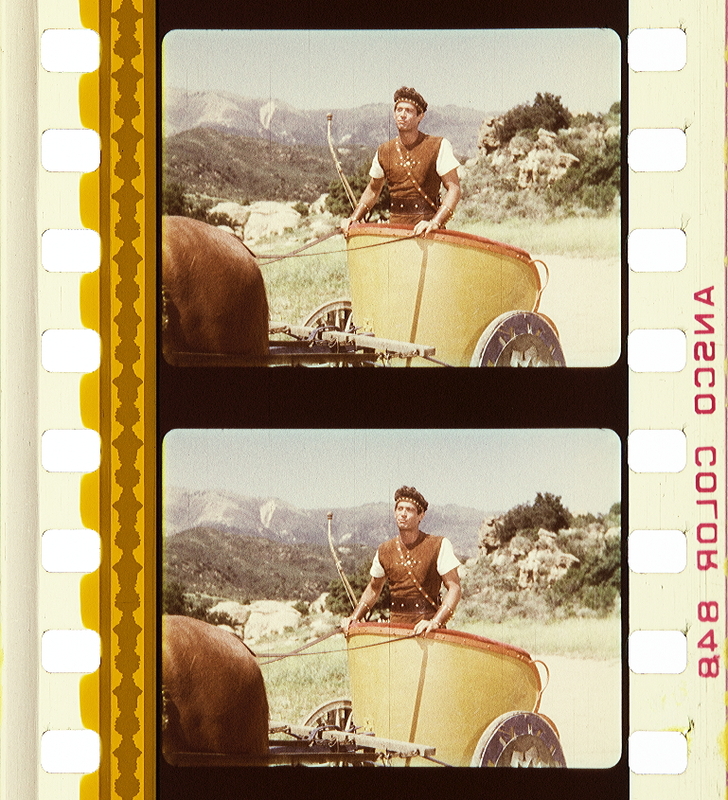 Among the foremost of these new processes is Ansco color, used for filming and printing MGM’s The Wild North. In this production the full range of tone and color faithfully reproduced the freshness and ruggedness of the Canadian Northwest. The blue of sky and water, and the innumerable tones of green in natural foliage, flashed forth clearly and brilliantly on the screen to give a perfect illusion of reality. In The Wild North pictorial grandeur is enhanced by a range of light-value contrasts in perfect color balance from the eye-dazzling highlights to the wealth of pictorial detail simultaneously visible in deep shadows. With film of such range of response, exterior color scenes need no longer appear as though photographed at high noon – flat and uninteresting; but producers can capture the flavor of time, locale and atmospheric and seasonal mood in the color medium. 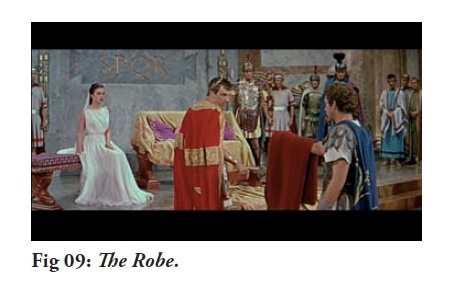 Color, that is, becomes a dramatic medium, to be treated as such by the more sensitive masters of movie-making. Of direct importance to the projectionist in his own immediate responsibility is the fact that Ansco color film possesses the same consistently sharp focus as black-and-white; and comparable resolving power – the ability to separate and present small details. These prints require no special projection technique. Color on the theatre screen is always at its best, however, when the projectionist gives adequate attention to the arc lamps to avoid faulty screen illumination resulting from discolored or uneven light; and, of course, when all projection gear in the light path is kept immaculately clean. Ansco color prints are made on high-acetyl base of first quality and are, therefore, readily spliced with the same safety cements or double-purpose cements that give satisfactory results on black-and-white high acetyl-prints. There are three main types of color film: (1) those that have color built into the photograph emulsion, and hence are exposed and printed photographically; (2) those that have the images stamped on the film by dye-soaked, relief-image matrix films, and (3) those that utilize chemical dye-toning of black-and-white emulsions, usually coated on both sides of the film-base. Ansco color, the subject of this article, belongs to the first class. Its camera is an ordinary camera, without color filters or beam-splitting optical system. Only this and other “monopack” films can be exposed in ordinary single-aperture, single-magazine movie cameras, developed on ordinary black-and-white processing machines and printed on ordinary black-and-white printers. This simplicity is possible only when the color has been built into the emulsion during manufacture of the raw stock. All natural-color photography involves some method of splitting up the vari-colored light of the scene to be photographed into three primary components, thus forming three separate images, or “color records.” The light is analyzed in the camera into its components; while in the print these components are brought together again to synthesize the colors of the scene photographed. The color-photographic analysis may be accomplished by simultaneously exposing three negatives, each through a separate color-filter, which, of course, requires a special beam-splitting camera having three picture-apertures, three sprocket-trains, etc. ; or else through a simplified variation that permits two records to be made through a single aperture. In Ansco color, however, the color-analysis is accomplished inside the emulsion of the negative. There are three color-receptors in the human eye. These are sensitive to red, green (a very slightly yellowish green), and indigo (violet-blue). When colored lights are mixed on a white screen, it is possible to reproduce all colors (including hueless white) by combining red, green, and indigo in various proportions. R, G, and I, therefore, are the three primary colors. Painters, however, have a different set of ”primary” colors which they use when mixing pigments. These are cyan (a slight greenish blue), magenta (a moderately purplish red), and yellow (very slightly greenish yellow). Actually, C, M, and Y are not primary colors but complimentary to the primaries. 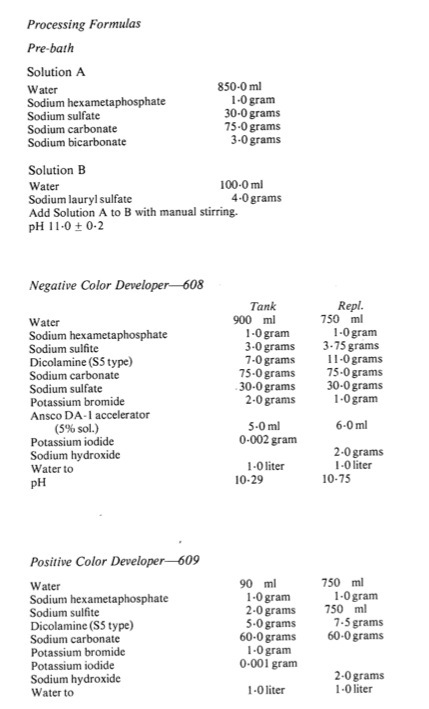 In Ansco color negatives the light-sensitive emulsion contains built-in cyan, magenta and yellow “process colors” sensitized to the same spectral bands, or regions, to which the three color-receptors of the human eye are sensitive, just why C, M, and Y dyes are used for building up the images on color film, instead of the true primaries R, G, and I, will become clear when the process is examined in detail. To do this, let’s forget Ansco and other color processes in commercial use, and invent one of our own. It may not have much practical value; but it will clarify the principle involved in making a natural-color print from the three-color records. Suppose three negatives are exposed in a beam-splitting, 3-aperture color camera. These color negatives will develop black-and-white, of course, and all three will look exactly the same except that the densities of all colored objects photographed will be more or less different on each negative. In other words, the color values are “latent” in the three simultaneously exposed negatives. We then make a black-and-white print from each negative. Now if the black-and-white image on the positive printed from the “red-record” negative is converted – by chemical toning, let’s say – to that color which ABSORBS red light from white light, the image will then subtract red from all the areas where no red was present in the original scene. The color which is completely red-subtracting happens to be cyan! Remember – we are not tinting our red-record positive all over with cyan; we are only toning the photographic image from a black silver image to a cyan image. The same idea is carried out with the other two positives. The silver image on the film printed from the green-record negative will be toned to a magenta image because magenta absorbs all green. And the image printed from the indigo-record negative will be toned yellow. We now have three very pretty positives, one with cyan pictures, one with magenta pictures, and one with yellow pictures. But still no natural-color pictures. How can we get them? Place the three positives one over the other in exact registration and glue them together so they won’t slip out of line – that’s all we have to do. Each process color (C, M, or Y) will subtract its proper primary color (R, G, or I) from the white light of the projector, and lo! we obtain a picture in perfect natural color. Now three thicknesses of film glued together admittedly might be loo bulky for the smoothest projection results; so the best commercial processes superimpose all three colors (C, M, and Y) in one coating of emulsion. In imbibition-process color films the image is built up in three printings on a single film. 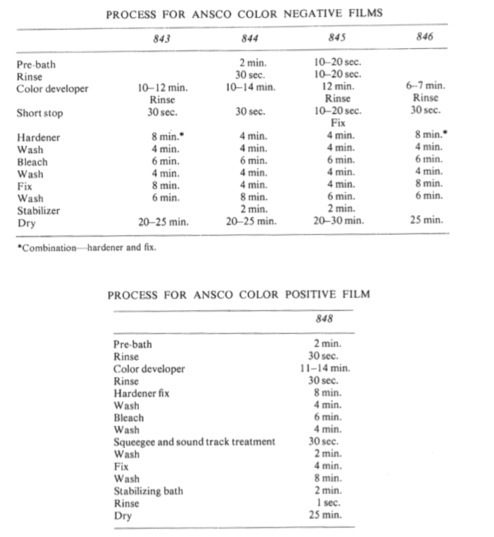 In Ansco color films there are three very thin color-sensitive and color-forming emulsions coated on one side of the film-base. The total thickness of the Ansco color multilayer emulsion “pack” is not appreciably greater than that of regular black-and-white emulsion. 1. The Indigo-Sensitive Layer. The Ansco color multilayer emulsion is surfaced by a thin layer of glossy gelatine which protects the emulsion from accidental scratching. Directly underneath this invisible protective coating is a layer of photo emulsion which is affected only by indigo-violet light, and does not respond to green or red. This emulsion, therefore, constitutes the indigo record. Below the indigo-sensitive emulsion is a yellow filter-layer which screens indigo light from the two emulsions which lie below it. The deep yellow color of this gelatine layer is produced by colloidal silver – dispersed silver grains much smaller than those in a black or gray silver image. Red and green light pass practically unimpeded through this filter-layer, since yellow represents white light from which indigo rays have been removed (leaving red and green). 2. The Green-Sensitive Layer. Under the filter-layer lies an emulsion which is sensitive to both green and indigo light. Indigo light, however, is prevented from reaching this emulsion by the yellow filter-layer. This emulsion, accordingly, photographs only green light, and is known as the green record. 3. The Red-Sensitive Layer. Under the green-recording emulsion there is a special emulsion which is “blind” to green, but photographs red light. This emulsion is, of course, also protected from indigo-blue by the yellow filter layer. It therefore constitutes the red record. The red-sensitive emulsion is coated on the clear high-acetyl safety-film base. But coated on the non-emulsion side of the base is a dark “antihalation” coating which prevents the light passing through to the back of the film during exposure in camera or printer; from being reflected and scattered into the light-sensitive emulsions, spoiling the image with glare-spots and halos. All camera film, whether color or black-and-white, has an antihalation backing which washes off when the film is developed. A “pack” of three microscopically thin emulsions, each sensitive to a different primary spectrum-color, is not enough, by itself, to produce a picture in natural color. If this were all there were to Ansco color film, it would, behave exactly like black-and-white film even though latent color values reside in the three sensitive layers. Something more must be put into the film to transform color values into actual color that we can see. Ansco must “tone” the three sensitive layers to their latent color values of cyan, magenta, and yellow. To accomplish this, there are added special chemicals called “color-formers,” a yellow color-former being incorporated in the indigo-sensitive emulsion, a magenta color-former in the green, and a cyan color-former in the red-sensitive layer. The color-formers have no color of their own, but they react, during development of the film, with “dye-couplers” in the developing solution to form the desired yellow, magenta, and cyan dyes. Because these dyes are complementary in color to the primaries recorded, the new Ansco color film is called a multi-layer complementary-color film. The triple-layer cyan, magenta, and yellow images are entirely equivalent to the three glued-together positives we imagined a few paragraphs back, but thin enough throughout their triple ply for accurate focusing and flexible enough for practical, ordinary projection. And they are characterized by extreme stability of the dye images. Ansco Color Negative Film Type 843 is exposed in the usual way in any 35-mm motion-picture camera. This camera film is intended for exposure with day-light-quality light-sources, although overall color balance on a movie set is not critical. It is only necessary to have all light sources – low-intensity arcs, high-intensity arcs, and incandescent lamps – balanced to the same color temperature except where special effects are desired. Standard filters used in all interior color filming enable a proper balance to be obtained. In a regular black-and-white negative all tones are reversed – shadows and dark objects in the photographed scene coming out light on the negative, and the highlights coming out dark. So also with Ansco color negative film. And because all photographic values are reversed, the colors of the photographed scene are reversed to their complementary colors – blue sky appearing as orange, red blood as pale blue-green, etc. Ansco color negative, therefore, is a true negative, and from it Ansco color positives are made. So far nothing has been said of the sound-track. Sound is not recorded directly on the picture negative in professional movie-making, but on sound-recording stock by a recording head driven in synchronism with the picture cameras. The original sound recordings may have either photographic or magnetic tracks, magnetic recording being in favor at the present time because of its high fidelity and low noise-level. Whichever recording method is used, independently recorded sound-effects and background-music tracks are properly “dubbed” into the principal record of the dialogue and sounds that originated on the set during shooting. Sound mixing is accomplished by means of an apparatus which has several soundheads (reproducers) feeding their combined output into a single recorder. The chief recordist sits at the console of the mixer like an organist and manipulates the volume controls which regulate the strength of sound from all the simultaneously-playing tracks. The resultant, or mixed, sound is recorded photographically on a single film. This film is the master sound negative from which a master sound positive and a number of duplicate sound negatives, used for printing the soundtrack on the theatre-release prints, are derived by contact-printings. This brings us to the matter of making Ansco color sound film prints for theatre projection. Now, release prints are only very rarely made from the original camera negatives, not even in black-and-white work. As is the case with the soundtrack recording, a number of duplicate negatives are prepared for printing the release positives. The preparation of these picture dupe negatives is an interesting process, and provides a peep behind the scenes of professional film make-up. These problems can be solved very simply and satisfactorily. This can be, and is, done on occasion; but professional productions involve optical effects which are not present in the camera negatives. These include fades, dissolves, wipes, photomontages, multiple exposures, travelling-mask shots, etc. It is considered unwise to cut these optical effects into the original camera negative, a mighty precious commodity. Then, too, it would be extremely foolhardy to risk damage to the original negative through the routine printing of several hundred release positives. In fact, in order to speed up the work and maintain good picture and sound quality, it is mandatory to make a dozen or so duplicate negatives, some of which are sent to foreign countries for release-printing overseas. From the original Ansco Color Type 843 Camera Negative Film a master positive film is printed. This may either be in full color by printing on Ansco Color Type 848 Positive Motion-Picture Printing Film, or (as is preferred in professional practice) the master positive is made in the form of three black-and-white positives, one for each primary color. The development process for Ansco color release prints is the same for the negative, except that special treatment is given to the soundtrack in order to obtain a regular silver-image track. Interesting is the fact that the sound-track may be printed in any one, any two, or all three of the emulsion layers of Ansco color film. If, for example, an indigo filter be placed between the light and the sound negative in the printer, the track will print only in the top indigo-sensitive emulsion. If the filter be cyan, transmitting both indigo and green light, the track will print in both the top and middle layers. With no filter all three layers will print. The top indigo-sensitive layer was used for printing the soundtrack of MGM’s The Wild North. This layer has the finest grain and does not require any electrical high-frequency equalization to equal the frequency-reponse characteristics of black-and-white prints. Other laboratories, however, are obtaining good results with 2- and 3-layer tracks. This description concerns the new Ansco color film as it is being made and used at the present time – a fact to bear in mind in view of continued progress in the popular and rapidly expanding process of making motion pictures in full natural color. Further improvements are inevitable. It is quite possible, for example, that the yellow filter-layer of colloidal silver may soon be eliminated. The Ansco Color Negative/Positive Process was a three-color subtractive system for color cinematography introduced in 1953 by the Ansco Division of General Aniline and Film Corporation.1 When it was introduced the process consisted of three elements that could be used singly or together: a coupler-incorporated three-color negative film for an original photography, a coupler-incorporated three-color duplicating negative film, and a coupler-incorporated three-color release print film. Following the introduction of its color negative film the Ansco Company continued to improve its product. Three different camera negative films were manufactured before the film was eventually discontinued. 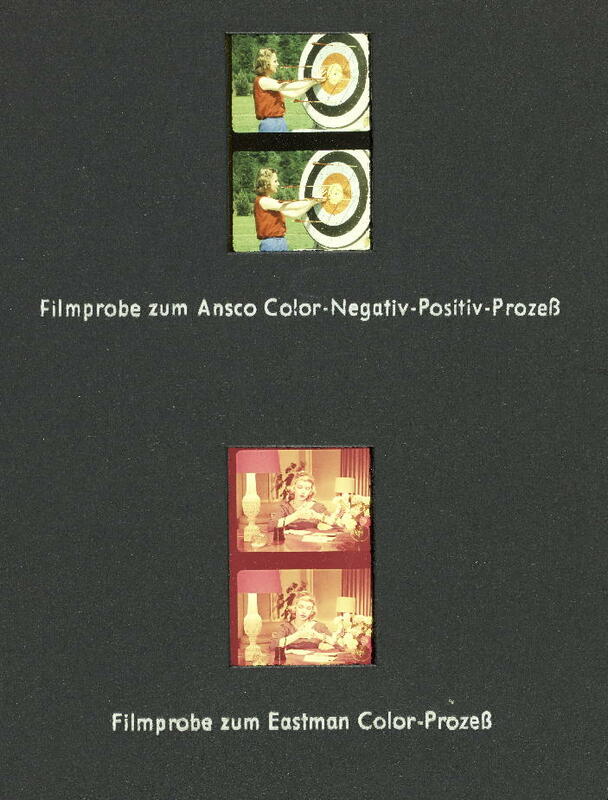 The camera negative films manufactured under the name of Ansco Color Negative were multilayered color films which consisted of three light-sensitive emulsions sensitized to red, green and blue light respectively, and coated on a single film support (Fig. 49). Incorporated in the emulsion layers were dye couplers which reacted simultaneously during development to produce a separate dye image in each layer, complementary to the sensitivity of the layer. The light and dark areas of the image were reversed with respect to those of the original subject. 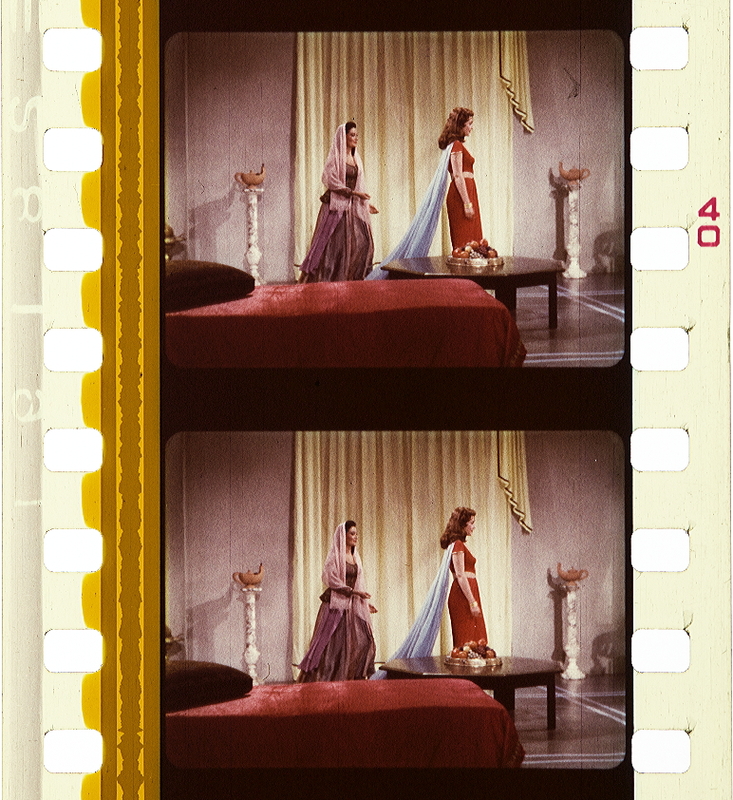 Also the various color areas of the negative were complementary in color to the corresponding areas in the original scene. In order to obtain maximum image sharpness it was necessary to produce a dye image in closest proximity with the originally exposed silver halide grain. To accomplish this it was important that the color coupler surround the grain so that the coupling reaction can take place in situ with the silver halide grain. 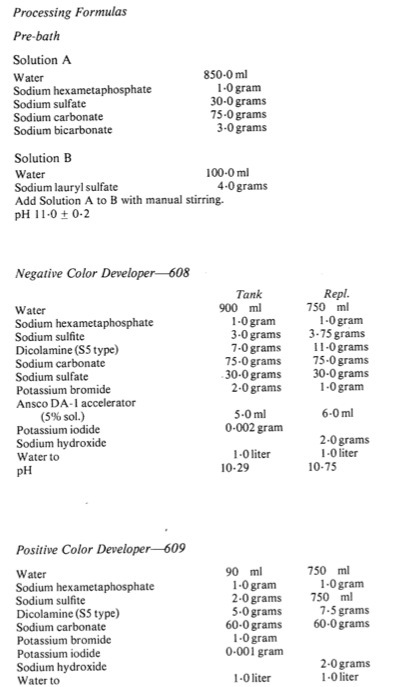 The Ansco Color couplers were anchored in the emulsion layers by means of the specific chemical configuration of the color coupler molecules. A fatty acid molecule of large molecular size was chemically combined with the dye coupler molecule through a short linkage. A color negative film balanced for use under average daylight conditions, that is, for a mixture of sunlight and some blue sky. The speed of this film was E.I. 16. For daylight or arc light exposure it was recommended that an ultraviolet absorbing filter such as the Ansco UV 16 be used on the camera lens. Normal contrast for this film was Red 1·00, Green 1·00, and Blue 1·25. A color negative film balanced for use with 3200°K tungsten quality illumination. The speed of this film was E.I. 16 tunsten. According to the manufacturer this film could be used with daylight illumination without loss of speed by using a suitable conversion filter such as the Wratten 85 B. Normal contrast for this film was Red 1·00, Green 1·00, Blue 1·25. A color negative film balanced for use with 3200°K quality illumination. The speed of this film was E.I. 25 tungsten and 16 daylight, with a Wratten 85 filter. This film was manufactured with a safety base which contained an orange tint which remained after processing. The purpose of this tint was to match the camera negative to inter-negative films which have a dye mask and thus permit intercutting of the camera negative and inter-negative. Normal contrast for this film was obtained by developing to a green gamma of approximately 0·70. The Ansco color duplicating negative film was a multilayered color negative film similar in layer arrangement and color absorption characteristics to Ansco Color Negative Film. Its color sensitivity, however, was different from the camera negative film. It was similar to the color print film. A duplicating negative film which consisted of three light sensitive emulsions sensitized to red, green and blue light, respectively. The sensitivity of this film was balanced for exposure by a tungsten light source of approximately 3000°K. The exposure index was 0·60 to 1·0. Normal contrast was 0·90 to 1·20; however, development could be carried to gamma 1·5 or higher, if necessary. 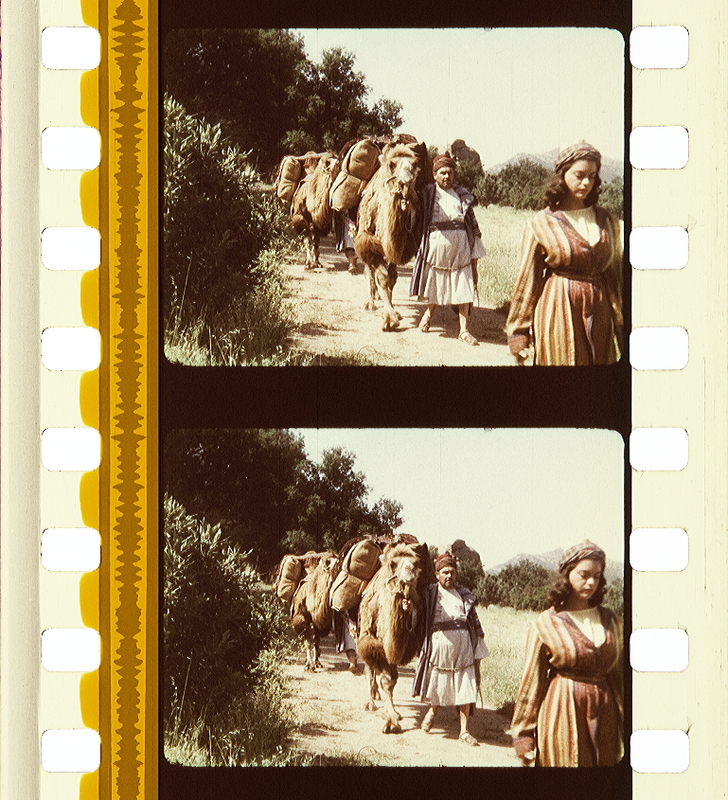 The print film manufactured to be used with Ansco Color negative and duplicate negative films was multilayered color film which consisted of three light sensitive emulsions sensitized to red, green and blue, respectively, and coated on a single film support. Incorporated in the emulsion layers were dye forming couplers which react simultaneously during development to produce a separate dye image in each layer. When printed from a color negative, a color duplicate negative or a set of tri-color separation negatives, a three-color reproduction of the original was obtained. The couplers used in this film are similar to those described previously for the negative film. A color positive film balanced for printing with filtered tungsten illumination. The speed of this film was similar to black and white positive, approximately E.I. 1·5. 2 ROWAN, A ., “The Wild North Introduces MGM’s New Ansco Color Process,” American Cinematographer, March, 1952, pp. 106-107, 122-124. 3 Variety, January 6, 1954, p. 51. 4 Technical Service Bulletin # 6.41 (Professional Motion Picture Department, Ansco Division, General Aniline and Film Corporation, Binghamton, New York, December 1, 1957). 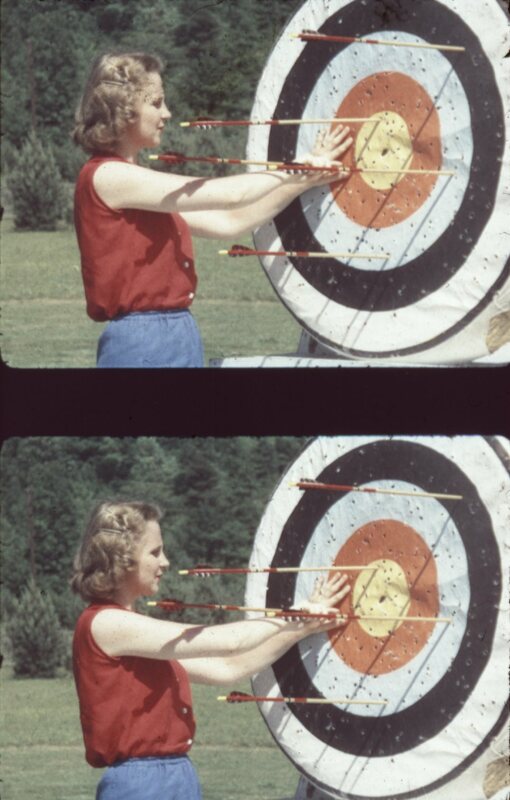 5 How to Use and Process Ansco Color Negative (Professional Motion Picture Department, Ansco Division, General Aniline and Film Corporation, Binghamton, New York, April, 1957). 6 Technical Service Bulletin # 6.31 (Professional Motion Picture Department, Ansco Division, General Aniline and Film Corporation, Binghamton, New York, October 15, 1951). “Nevertheless it was two years before Anscocolor, a multi-layered reversal stock in which each layer would absorb its proper colour and filter the light before it penetrated to the next layer, was ready. Processing Ansco involved nothing other than activating the dye-couplers already present in the film. This made it far quicker to develop than Technicolor. The German wartime inventions included a sturdy but very thin base on which could be attached three layers plus two separation filters. Given this, Anscocolor could be employed in conventional cameras and under much lower light levels than Technicolor where, to begin with, the light was split to expose two strips of film. 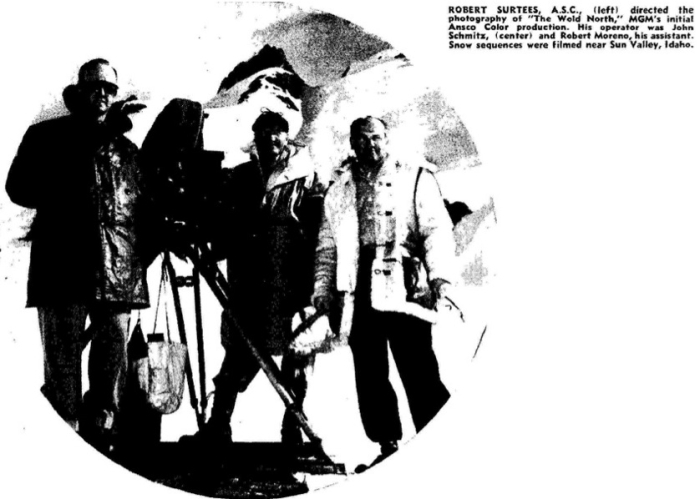 Ansco’s first commercial film, Climbing the Matterhorn, was made for Monogram Pictures in 1948.24 The ability to take advantage of outdoor light and colour conditions was well displayed, winning Ansco an immediate contract with MGM. With a secure part of the expanding US market, Ansco set up a laboratory, in Paris in 1949 hoping to claim the market vacated by the failing additive processes. But by this time Agfa’s other child, the Belgian Gaevert Co., had perfected its Gevacolor and it too moved confidently into Paris. Gevacolor and Anscocolor were comparable economically and aesthetically; Ansco was perhaps a bit sharper, but Geva was available in negative as well as reversal. “With practically no fanfare, but with meticulous planning and extraordinary discretion, Eastman commandeered the manufacture of color motion picture film negative. Its single domestic competitor, Ansco film, secured an exclusive contract with MGM, and with the release of The Wild North in March 1952 actually beat Eastman to the gate in exhibiting the first Hollywood monopack feature.22 But by the end of 1954, after the last stragglers had finally returned their Technicolor cameras, Ansco was out of the movie business, and through the rest of the decade Eastman provided the color negative to all the major studios and virtually all the independents. 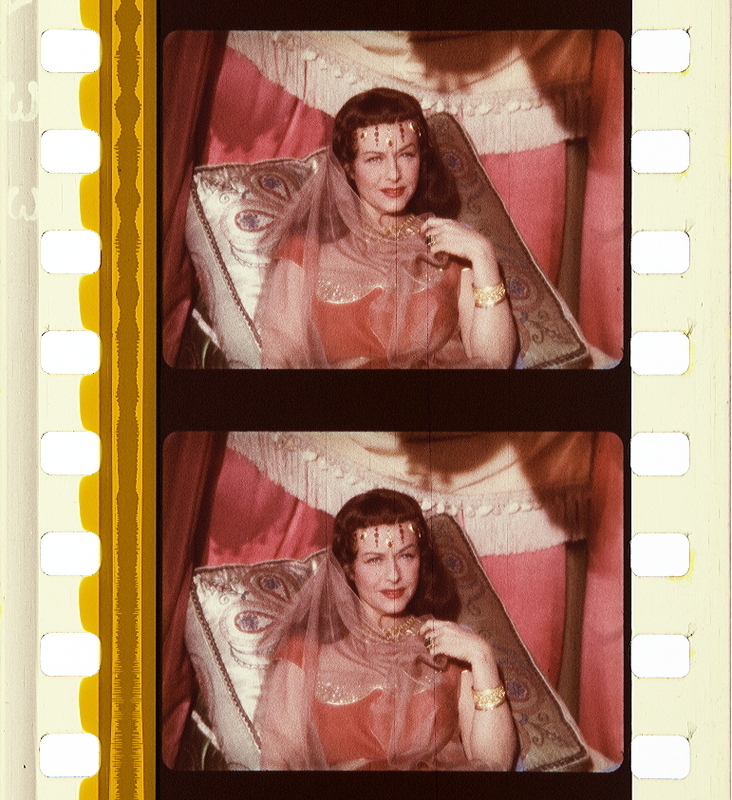 28 Eastman Color western and melodrama counts derive from The American Film Institute Catalog, 1951–1960, Chadwyck-Healey/American Film Institute, 2003–2008. The rise of the color western in the early 1950s was particularly dramatic. By my count, a total of twenty westerns filmed in color were released from 1940 to 1949, none during America’s war years. At the end of the decade, the number shot up from three in 1949 to 11 in 1950, then to 23 in 1951, 21 in 1952, 21 in 1953, and 20 in 1954. In short, as many color westerns were shot each year in the early 1950s as were shot in the entire preceding decade. “Anscocolor (1945). La prima versione dell’Anscocolor consiste in una doppia pellicola invertibile (in cui, cioè, il passaggio dall’immagine negativa a quella positiva avviene su un unico supporto mediante il processo chiamato, appunto, di inversione). La prima pellicola invertibile è quella utilizzata nella macchina da presa (Camera Film, Type 735, sensibilità 6 ASA); da essa è poi ricavato il numero di copie desiderato su un secondo supporto invertibile, usato al posto del tradizionale positivo (Print Film, Type 732). La Ansco commercializza anche un terzo tipo di pellicola invertibile (Duplicating Film), destinata alla realizzazione di copie (del Camera Film) ed effetti ottici. Nel 1950 questo sistema, molto complesso, è abbandonato in favore del tradizionale metodo basato su un supporto negativo e uno positivo74.